The Eliteface Beaks look really good this time. More in line with the ********* of **********. Also, would they take damage if thrown by Jotun? I would say yes. A flying figure, remember, can't be grabbed in the first place - it's not as though they can be thrown, but that their flapping wings save them from the two wounds. They must be able to flap away from Jotun's grasping hand in the first place. If he could somehow catch one and then throw it, I imagine it would be slammed too hard and quickly into the ground to be able to break its fall with wings. I see the Beaks the same way. I am excited to see what you guys find with the Sneaks. As far as Throw is concerned, I just read the power again. It doesn't anything about fall damage, so it would work on the Sneaks like any other non-flyer. Slavi'Vaen by flameslayer93 has received 6 NO votes to review (1Mmirg, Dad_Scaper, Elginb, Lamaclown, nyys, ZBeeblebrox) and is removed from the process. Beakface Sneaks by Super Bogue has received 6 YES votes to review (1Mmirg, Dad_Scaper, Elginb, Lamaclown, nyys, ZBeeblebrox) and moves on in the process. So I'm finally resubmitting my idea since I believe after some testing it simply works best in this design. Balance - This newer variation merely removes his toughness in order to make it reasonable for melee units to be able to battle Gor'Vath. I know the first version was almost indestructible to melee centered armies. About the only unit that could take him down easily was the Iron Golem. Playability - The synergy with the Arrow Gruts is pretty obvious and really helps boost these older units playability a great deal. Creativity - I'd like to think he's a cool idea. Theme - I think he solidly fits within the Heroscape world. Accessibility - The figures used at the D&D Miniatures Hezrou, the older figure from the Giants of Legend set and the newer from the Legendary Evils. Both range in cost from about $6 to $15 depending on where you buy. Auggie alone has 24 currently in stock, so along with other sites there is a good 50 or so of that version. ^ so pumped about this. I really hope it passes. 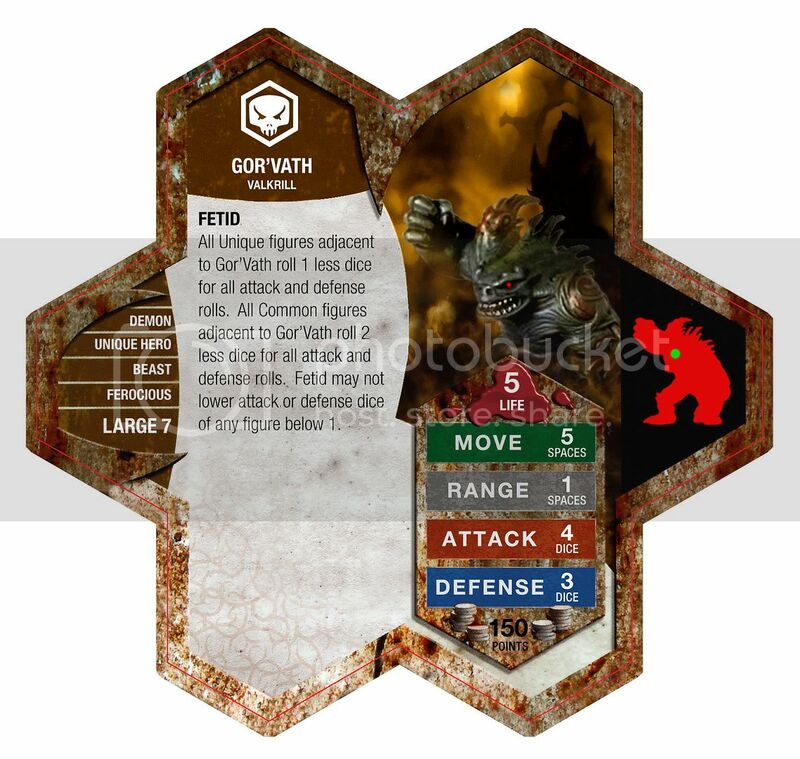 I loved the original Gor'Vath, and am excited to try out this updated version. I vote YES to review Gor'Vath by robbdaman (I'll get him up in the OP when I'm back at my desktop instead of on a persnickety laptop). So, robbdaman, did you change him to Valkrill to soften the synergy with the Orc army? (i.e. no bonding with Ornak). Robb I'm so glad you updated Gor'Vath. He's still one of my favorites I've seen on her and this version look more balanced. Plus i like that he's Valkrill now, a 100% Yes to review. One of my favorite things about the original Gor'Vath was the simplicity and theme packed into Fetid. Well, it's not simple anymore. This is a different unit with a different feel on the card. It does look like robb heard our comments earlier. With only 3 defense, squads of melee commons, with an attack of only one, still have a fighting chance. I'll give it a shot. to review. Unless there are Arrow Gruts around. Last edited by dok; September 5th, 2011 at 12:12 PM. Reason: I would test AGx4+Swogx4+Raelin+Gor'Vath+Isamu at 500.